Fifty eggs, a kilo of flour, a kilo of sugar, a litre of cream, a spit and an open fire – does that sound like any cake you know? 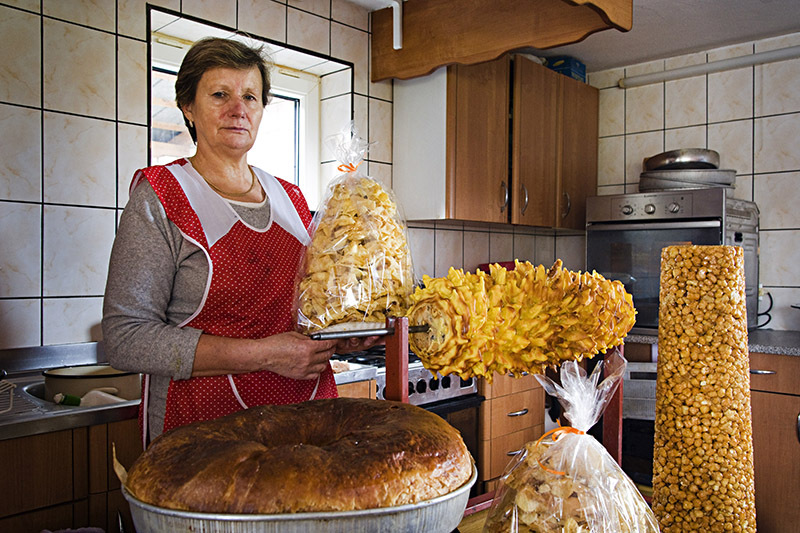 Sękacz is notoriously labour-intensive and rarely made at home, but it's also the regional pride of Northeast Poland. Sękacz (sen-CATCH) – which literally means ‘knotted cake’ ‒ is a distant cousin of the German Baumkuchen, the French gâteau à la broche, the Swedish spättekaka and a close relative of the Lithuanian šakotis. A type of spit cake made with butter, eggs, flour, sugar, and cream, its irregular shape resembles a tree with knots. It became popular in Poland during the Polish-Lithuanian Commonwealth (1569-1791), but its origins are subject to controversy. As almost everything in European history, the idea of baking layers of pastry over an open fire can be traced to the Ancient Greeks. From there on, each region developed its version of the story about the origins of the particular cake prepared using this technique. According to one of the legends, the cake was popularised in the Middle Ages by a wandering journeyman who learned the recipe in Cottbus and then brought it to Berlin. It's possible that Lithuanians, who allegedly ate sękacz on their way to Grunwald before the great battle of 1410, got the idea from the Germans. It's also possible they got it first, since the cake is often attributed to the Yotvingians, a Baltic tribe of who settled in Podlasie during the Middle Ages. In the Polish version of the story it's the 16th-century queen Bona Sforza – who brought many agricultural reforms and Mediterranean vegetables to Poland – who made sękacz popular on Polish ground. 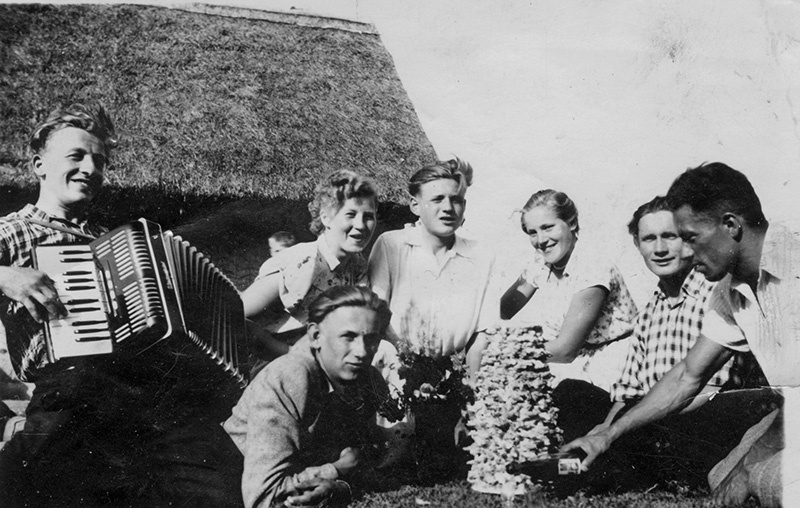 The cake was a culinary tradition of the remote village of Berżniki in Northeast Poland. When Queen Bona visited the area, she liked the sweet delicacy so much that she decided to order a sękacz for the wedding of her son Zygmunt August. When the beautiful tall amber-gold cake was brought to the table in Kraków, the notoriously capricious queen was finally satisfied. Spit cakes similar to sękacz are baked in Germany, Sweden, Switzerland, France and Hungary, but surprisingly they are also found in Japan, where they were introduced in the early 20th century by German confectioner Karl Joseph Wilhelm Juchheim. Just like in Poland, they are often given to wedding guests as a token of thanks for their attendance. There are some more prosaic explanations of why the cake was invented; Krzysztof Luto, a producer of traditional sękacz cakes from Daniłowce says that historically, the main reason for creating this type of cake was not its flavour, but the the way it allowed to preserve produce during the winter. ‘Food production was strictly seasonal. Hens only layed eggs in the spring and summer, and cows were only milked during the warmer months. There were too many eggs, too much butter and cheese. Something had to be done to preserve these products. Cheeses were smoked and dried, and cakes were baked out of the flour, eggs, butter and honey. Pouring the pastry on the rotating spit created thin layers that helped smoke it and remove excess water. These cakes could last almost six months. Such a high-calorie product helped people survive the long, cold winter’. There are a few reasons for this increase in popularity. First, Polish tourists buy them as souvenirs for their families, thus propagating them throughout Poland. Orders now come from different places, which tells me that people like sękacz. The so-called ‘rustic tables’ with traditional food at wedding receptions also contributed, because the cake can double up as an ornament. We get most orders for Christmas and Easter. The difference between Polish sękacz and Lithuanian šakotis is pretty subtle, but experts claim that the Lithuanian recipe is denser, more knotted and decorative, while its Polish equivalent is softer and more delicate. A few years ago the mayor of Puńsk, where 75% of the population – including the mayor – is Lithuanian, claimed he prefers the Polish version, but that the cake is part of a common heritage, just like cepeliny and chłodnik. In the Podlasie region no holiday would be complete without sękacz. 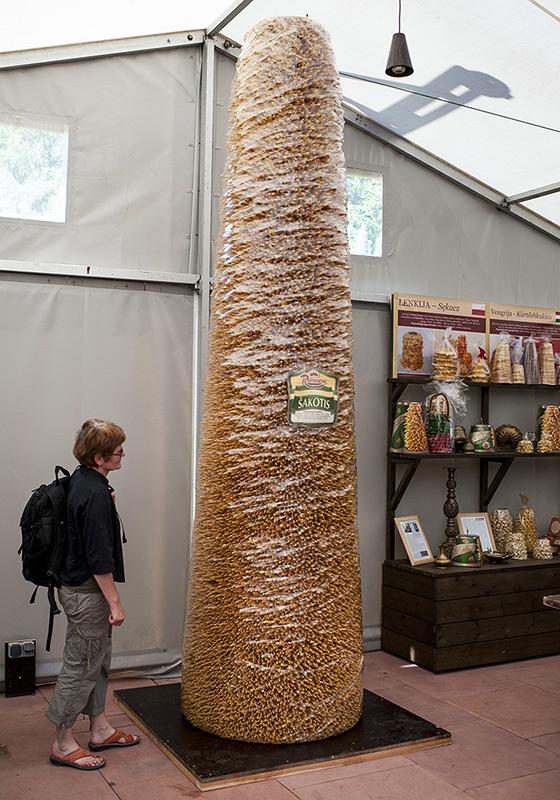 Even though traditional producers frown upon the idea, it is now possible to buy mass-produced, packaged pieces or small bites of sękacz (often covered in chocolate, crushed hazelnuts or even coconut) all around the country. What's even more bizarre is that another sweet is sold under the name – a caramel or hazelnut-flavoured bar which has nothing to do with the original. On the other hand, the cake has also inspired high-profile chefs. During the Cook it Raw event in 2012, when famous chefs from around the world, including Wojciech Modest Amaro and Rene Redzepi, visited Northeast Poland to look for new tastes, sękacz was one of the brightest highlights. Amaro even created a dish called ‘Forrest Gump’ ‒ a savoury sękacz with boletus mushrooms, juniper and pine with mushrooms in saffron milk cap oil and a bison grass emulsion. Although sękacz is not the most convenient cake to bake at home, if you have a spit and an open fire, you can try your luck with the recipe below. Mix the butter with the caster and vanilla sugars until it dissolves. Stir in the egg yolks. Divide the egg whites into 4-5 portions. Slowly add the flour to the egg yolk mixture. Add the sour cream, aroma and lemon juice and gently incorporate into the batter. Divide the batter into 4-5 portions. The egg whites have to be whipped into soft peaks right before adding them to a portion of the batter – this will make the cake fluffier. Whether on an open fire or in a big oven, the batter now has to be gradually poured over a horizontal, rotating spit which has been greased and heated. Each layer has to be delicately baked to create the cake’s characteristic thin, brown stripes. The process lasts at least 3 hours. After the sękacz is baked, it has to solidify on the spit for 5 hours. Only then has it hardened enough to stand.